If the city of Beirut doesn’t leap to mind as a hotbed of avant-garde musical activity, listen up: since 2005, the Al Maslakh label (translation: The Slaughterhouse) has been documenting far-thinking sounds from the small but vital Lebanese scene. 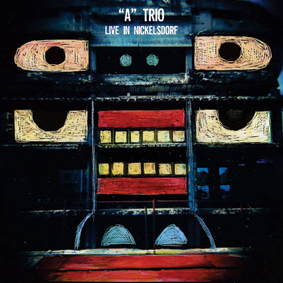 The “A” Trio’s first release, Music To Our Ears, was one of the most startling debuts of 2011; now, Roaratorio is proud to present their second album (and first vinyl release): Live In Nickelsdorf, recorded at the Konfrontationen Festival in 2012. While far from the first to employ extended techniques on their respective instruments, Mazen Kerbaj (trumpet), Sharif Sehnaoui (acoustic guitar), and Raed Yassin (doublebass) create a music that bears little relation to others who traffic in the same outer realms. Heavily textural, frequently perplexing, sometimes unsettling but always suffused with a provocative intelligence, this is the sound of a collective ur-mind that favors the long gesture over pointillistic strokes. Their capacity for generating aural illusions – one would be hard-pressed to identify the instrumentation as three acoustic instruments, with no electronics or overdubs whatsoever – is astounding, but it’s their skill at harnessing these uncanny tones into a consistently engaging and powerful sound-world that elevates the “A” Trio into the front rank of contemporary improvisational groups. A limited edition of 350 copies. Download coupon included. **** “The “A” Trio are Mazen Kerbaj on trumpet, Sharif Sehnaoui on acoustic guitar, and Raed Yassin on doublebass, three musicians well known from the Lebanese Al Maslakh label, now featuring on this limited edition LP from Roaratorio. What the trio does is amazing. They create a sonic universe well beyond the known possibilities of their instruments, and nobody (nobody!) could guess which instruments are being played if I had not already disclosed it. It is noise, it is minimal yet dense at the same time, played with a sense of urgency that is familiar to rock music, but then without the bluntness and the fixed rhythm. It sounds like sirens urging you on, to move to act to do something while at the same time stopping you in your tracks because the music (?) is spell-binding and paralysing too, taking the power out of your muscles, weakening your legs. It is fearful. Listen to the howls of the trumpet after thirteen minutes, or to the uncanny layers of screeching sounds that end the ominous first side. The second track, on side two, start with a strange rhythmic pattern of circling bowed bass and repetitive trumpet phrases that sound like a sax, deepening the intensity of the music, moving the sounds forward in an almost unavoidable way, beyond choice. It is terrifying with intensity, raw, direct and compelling, and the finale is absolutely hypnotic in its relentless violent drive.